Today’s recipe is another one I plan to make for Austin Bakes for Japan. Inspired by Stef and her vanilla bean buttercream (she said it tastes like melted ice cream! 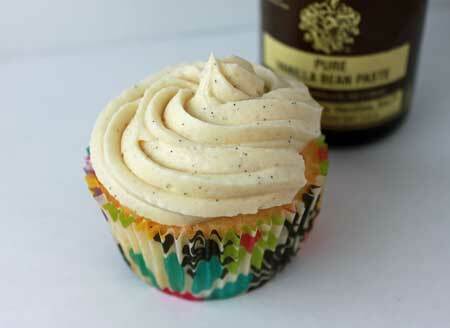 ), I made a batch of white cupcakes which really showcase the flavor of vanilla bean paste. Why the paste instead of the bean? Vanilla beans are pricey, but the paste has almost as much depth of flavor and costs about $8.00 a bottle — almost the price of one bean in some stores. I found mine at the grocery store down the street, but if your grocery store down the street isn’t a gourmet/grocery hybrid like mine, you can order vanilla beans off ebay, Nielsen Massey’s website or Amazon. Here’s the recipe. The cake is excellent! It’s adapted from a Cook’s Illustrated perfect white cake and it’s definitely the best white cake recipe I have. If you’d like to make a small batch of 8, I’ve also included a scaled down version of the cupcake which works really well. My favorite yellow or vanilla cupcake recipe. Can also be made with regular vanilla extract. Preheat oven to 350 degrees. Line 24 cupcake pans with paper liners. Combine egg whites, milk, almond extract and vanilla paste in a large liquid measuring cup. Mix with a fork until blended. Mix cake flour, sugar, baking powder, and salt in bowl of a stand mixer. Add butter and beat on low speed until mixture resembles moist crumbs, with no powdery streaks remaining. Add all but 1/2 cup of milk mixture and beat at medium speed for 1½ minutes. Add remaining ½ cup of milk mixture and beat 30 seconds more. Stop mixer and scrape sides of bowl. Return mixer to medium (or high) speed and beat 30 seconds longer. Divide batter evenly between cupcake cups . Bake on center rack for 20 minutes or until cupcakes test done – a toothpick should come out with moist crumbs. Let cupcakes rest in the pan for about 5 minutes, then carefully remove them from the pans and let them cool on a rack. To make icing, mix together the butter and powdered sugar. Mix in the vanilla bean paste and some of the milk. Beat on high until light and creamy, scraping sides of bowl. Add remaining milk if needed. Taste test and add more sugar, vanilla bean paste or milk to get the consistency you want. Heat oven to 350 degrees. Line 8 cupcake cups with paper liners. Mix egg whites, milk, almond extract and vanilla paste together in a 1 or 2 cup glass measuring cup. Mix cake flour, sugar, baking powder, and salt in mixing bowl ( I use a medium size bowl). Add butter and beat at low speed with a hand-held mixer until mixture resembles moist crumbs, with no powdery streaks remaining. Add all but 2 tablespoons of milk mixture to flour mixture and beat at medium speed for 1½ minutes. Add remaining milk mixture and beat 30 seconds more. Stop mixer and scrape sides of bowl. Beat for another 30 seconds. Divide batter evenly between cupcake cups and bake on center rack for 22 minutes. Let cupcakes cool in the pan for about 5 minutes then remove them from the cupcake pans to finish cooling. Makes 8. Christine, the cakes are very light and fluffy due to the egg whites, so I don’t think they’d make a good Bundt simply because my idea of a good Bundt cake is one that’s kind of dense. They’d be okay as an 8 inch cake, but you could still do better. There are several yellow cakes here that are good, but I haven’t yet picked a favorite. Here are links to a few I really like. And if you email me, I’ll send you some I like even better but which I haven’t posted yet. Instead of cupcakes, do you think the recipe could be used to fill a bundt (10 cup) or make two layer cake (8 inch in diameter pans)? I am looking for something faster than cupcakes. I made these, they are AMAZING! I was having a hard time finding an even decent tasting vanilla cake, and these blew me away. I blended vanilla beans in to my sugar with a food processor after leaving a bean pod in the container for a few days, then also steeped the milk with the vanilla bean (seeds scraped into the milk ,steeped with the pod, then removed the pod) and it was the most vanilla-y cupcake EVER. VERY moist, great crumb, it even looks beautiful. I hope everyone that comes across this recipe chooses to make it b/c you won’t be disappointed ! I am looking for a LOT of vanilla flavor, if I infused the milk with a vanilla bean (warming the milk in a sauce pan with the vanilla bean in it) would it hurt the cupcake? I liked the way it tasted in a different recipe and would like to do that with this if it’s ok, and won’t change the texture. What do you think? Christine, yes. I added it because I like it. You can always leave it out and use a little extra vanilla. I’ve been searching for “the” vanilla cupcake recipe and I hope this is it. Love the addition of vanilla paste as opposed to plain vanilla. I have one question though. Can you taste the almond extract? I finally made these last week and they went over really well at my work potluck. One co-worker told me they were “life-changing.” Thanks for always posting awesome recipes! Thanks for posting the review! This is now my one and only vanilla/white cupcake recipe (though I do plan on using different icings. Also, feel free to email if you ever have questions. I made these cupcakes for Easter dessert and they were a HUGE hit. I am a chocolate lover and did not think that this cupcake would satisfy me, but boy was I wrong. The cupcake itself is extremely light and airy. It has a similar texture to angel food cake which is bad because it can fool you into thinking that more than one cupcake is okay for you! The icing was fantastic!! I received vanilla bean paste for Christmas and had no idea what to do with it until now. Thanks so much for your blog, all of my desserts have come from here and they have never failed me! My daughter and I made these for my sister’s birthday celebration today. They were fabulous and drew raves from even the most die hard chocolate lovers. I am vanilla fanatic and usually use my vanilla bean paste to make KAF’s vanilla pound cake, but this might be my new favorite use! Thanks for the scaled down recipe as I will need to use that version in the future if I’m not baking for a crowd – these are dangerous to have in the house! Also the recipe is very forgiving. I was rushed and misread mixing directions, so while my quantities were right, things came together in a wacky order, but the cake was still delish! Thanks again for sharing another winner! The frosting is so wonderful. I think adding some chocolate syrup at the top will be yummier. Can’t get enough of the frosting! Anything with vanilla bean is so tempting! I keep looking at the vanilla bean paste on amazon.com, but can’t bring myself to spend the money. I love the King Arthur Baking Blog, though, so I’ll have to look into ordering it from them. I’ve had a few of their baking items on my wish list for awhile now. I just went to Central Market (in Dallas) this morning and bought some vanilla bean paste. I am definitely making these!!! Hope the bake sale is a success! Louise, I agree! It’s always nice when people like Matt take the time to reach out to customers. How cool is it that Matt Nielsen posted to your blog. We tend to think that companies are without faces. That was really nice of him. Beautiful, delicious, classic simplicity! I agree with the other posters…tastes like melted ice cream? Yummers! 🙂 Your goodies will be sell out in a wink. 🙂 These will certainly raise tons of much-needed funds for the relief fund. Best wishes to you and your fellow baker-volunteers! Hi Anna! Juts a quick note to thank you for mentioning us as a source for Pure Vanilla Bean Paste. I want to mention that King Arthur Flour’s Baking Catalogue sells our Madagascar Bourbon Pure Vanilla Bean Paste, a single origin vanilla paste made from beans grown on the isalnd of Madagascar. TJ Maxx and Marshalls sell just our Pure Vanilla Bean Paste which is a blend of growing regions and has a different colored label. Both can be used interchangeably but will taste just a little different. On the usage equivalency it is 1 tablespoon of Paste to 1 whole vanilla bean, so you’re right that this product goes a long way in replacing vanilla beans and is much more cost effective. Thank you again and keep up the delicious recipes! Glad you liked the frosting! I may give your cake recipe a try the next time I’m looking for a basic white cake. You did a beautiful job frosting that cupcake, and I’m sure it tastes as great as it looks. Thanks for introducing me to vanilla bean paste, I had never heard of it before. Frosting that tastes like melted ice cream?!?!?! I’m in :). Allison, Nielsen Massey has a little conversion chart on the label. It says you can use 1 teaspoon of paste for 1 teaspoon of extract. I bought some vanilla bean paste in Dec, but haven’t used it yet because I never know how much to use. Is there a standard conversion for paste in place of a whole bean? This looks delicious – I love the flecks of vanilla bean in the frosting! I found my vanilla bean paste at TJ Maxx (or it might have been Ross Dress for Less, similar store) for less than $6 – might be worth checking there! I love the vanilla bean paste too. It looks so great in your frosting. Okay… so I’d leave the bake sale with some chocolate skor bar cookies AND some of these cupcakes. 🙂 I think they’re going to sell out really fast! Gorgeous! I bet these taste incredible. I love vanilla bean paste. I need to buy some online again, because they don’t sell it here. It lasts such a long time. i would like to thank you for participating in this event – i’m certain your treats will sell out in a snap. my mother is from japan – she is the only one who ever moved away. (her grandfather is actually from sendai – the area at the epicenter of the devastation) all of our immediate japanese family live in the tokyo area (yokosuka/yokohama/kamakura) and i still have not been able to get thru to anyone. there are so many issues/problems right now that impact such a huge portion of the population of japan – food, water,electricity – you name it – it’s all in short supply at best. i am so thankful for people like you who want to help deal with this serious crisis that is rapidly impacting the entire world. from the bottom of my heart i wish to express my sincere gratitude to you and your fellow participants in this event – on behalf of myself, my mother and my family in japan. Cindy, I’m going to try the ice cream recipe Sheri (Pork Cracklin’s) posted in the comment section of my last ice cream post. Pam, these really are good cupcakes. The white cake is probably the best I’ve ever eaten and definitely the best I ever baked. Polly, I haven’t tried King Arthur’s vanilla paste. When I’m done with this jar I’ll have to order some. I am anxious to try this recipe. I purchased my vanilla bean paste from King Arthur Flour the last time they had free shipping! Had not used it yet. Thanks for all of the great recipes. Anna these cupcakes look sooooo delicious. Wish I had a bite. I have a jar of vanilla bean paste and have never used it. I got mine,,I think, from King Arthur right before the kitchen rennovation got started. Kitchen got finished this week so I am going to play in it all day Saturday and I will give these a try. I agree that the paste seems like a more reasonable purchase. Do you have plans for the leftover egg yolks? ?